You would not believe the amount of testing and photographs I took in my quest find a homemade dishwasher detergent that was any good. I was very happy with the final winner, though! The best part? It has a tendency to harden…which I leveraged into making dishwasher detergent tabs. No measuring. Just throw it in the dishwasher. 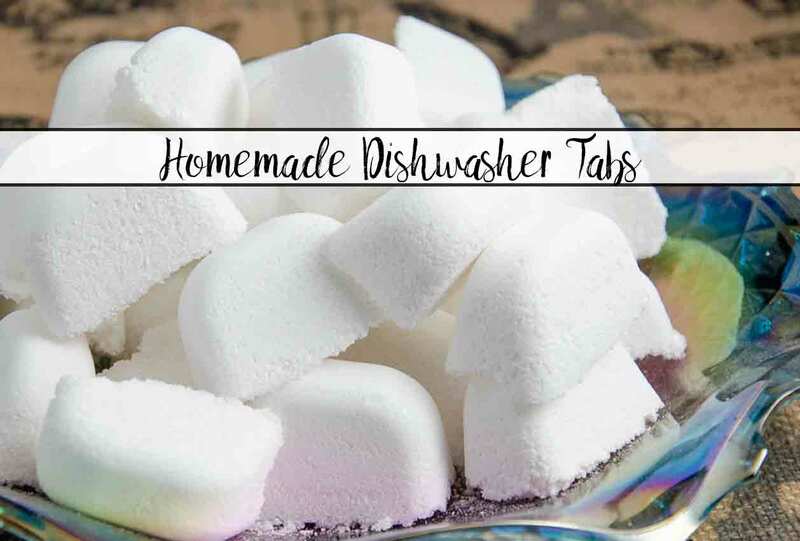 Dishwasher detergent tabs are easy to make and use only four ingredients. I’ve included some pictures of the quest along with a price breakdown. I actually included two version below. The non-Borax version is the more expensive of the two (but still cheaper than store-bought dishwasher tabs). I put the final “recipe” in a printable recipe card at the end. Despite the fact it’s a recipe…please don’t eat it. (Yes, I probably have to say that just to cover my behind). 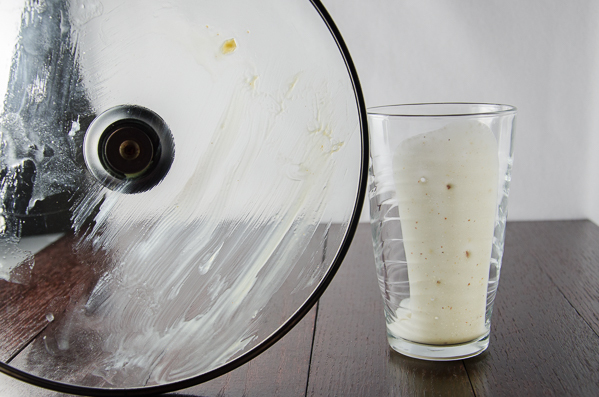 I tested every dishwasher detergent method by smearing grease all over a lid and dumping dressing in a glass. As you can see, some methods were complete failures! I tested every single method very thoroughly. (As you can tell by the grease and dressing smeared dishes above). Some the detergents worked okay. Some were horrible. The picture above is from the worst of the lot. Yikes! That went straight into the trash. The three finalist! I had multiple people test them out for me. The best one solidified on me. That gave me the idea of making dishwasher tabs out of it! Once I had my finalists, I had other people test them! Combined with my results, we had a winner! Honestly, the version with Borax was just as good, but I know some people have an issue using it in dishwasher detergent. 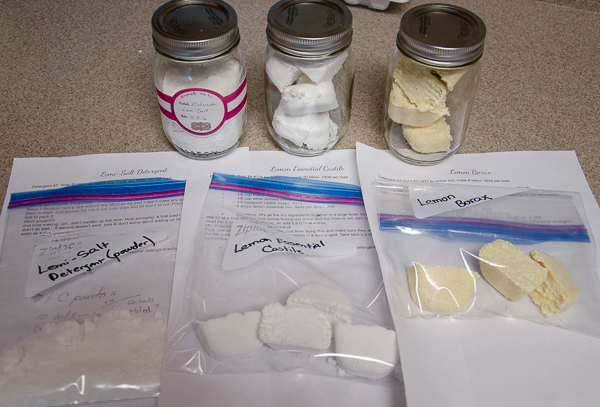 So I went with the homemade dishwasher detergent without Borax version. However, I included the Borax version at the very end of the post in case you like that one better (and want to save even more money). I did learn, though, that humidity causes this to clump up. Solid as a rock. Getting that out involved letting water run and run. But that was one very, very clean glass jar when I finally got all the dishwasher detergent out of it. haha. 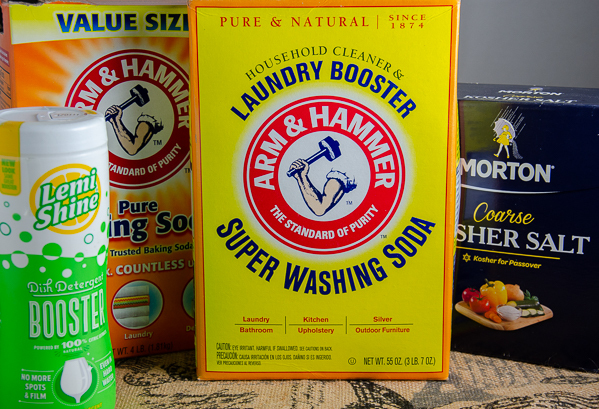 4 simple ingredients: washing soda, baking soda, coarse salt, and LemiShine. 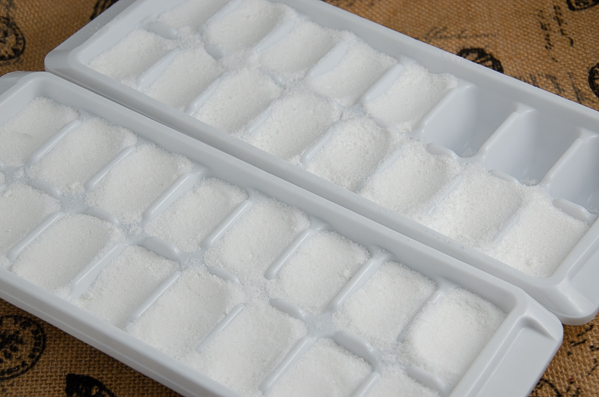 Mix and pack into ice cube trays. The amount of time to harden will depend upon local humidity. 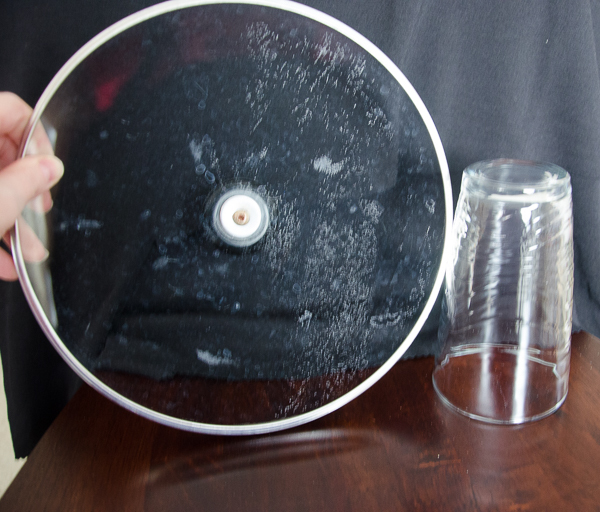 Washing soda: The link from Amazon so you can see what it looks like. But buy it at Wal-Mart. It’s only $3.97 for 55 oz. at Wal-Mart. Baking soda: 4 pounds at Wal-Mart for $2.24. Coarse salt: At Wal-Mart, it’s only $1.98 for 3 pounds. Lemi-Shine: Click on the link to see what it looks like. Before I started testing, I had never heard of this, so knowing how the product looks helps in stores. Buy at Wal-Mart where it is $3.38 for 12 oz. Finish Tabs: The absolute cheapest I could find was at Amazon. That was buying the mega-pack of 94. That was $12.59. The cheapest at Wal-Mart was the mega-pack of 85 for $13.47. Washing Soda ( 1 & 1/2 C.)- $3.97/55 oz means that 1 & 1/2 C. (12 oz.) costs $0.87. Baking Soda (1/2 C.)- $2.24/4 lbs. means that 1/2 C. (4 oz.) costs $0.14. Salt (1/2 C.)- $1.98/3 lbs. means that 1/2 C. (4 oz.) costs $0.165. Borax: The link is from Amazon so you see what it looks like. But buy it at Wal-Mart, where it is $4.47 for 65 oz. Epsom salt: You’ll find this in the health and beauty section at the grocery store (you wouldn’t believe how long I looked for it!). It costs $2.86 for 4 lbs. Lemon juice: $2.98 for a 32 oz. bottle. Washing Soda (1/2 cup)- $3.97/55 oz means that 1/2 cup (4 oz.) costs $0.289. Borax (1/2 cup)- $4.47/65 oz. means that 1/2 cup (4 oz.) costs $0.275. 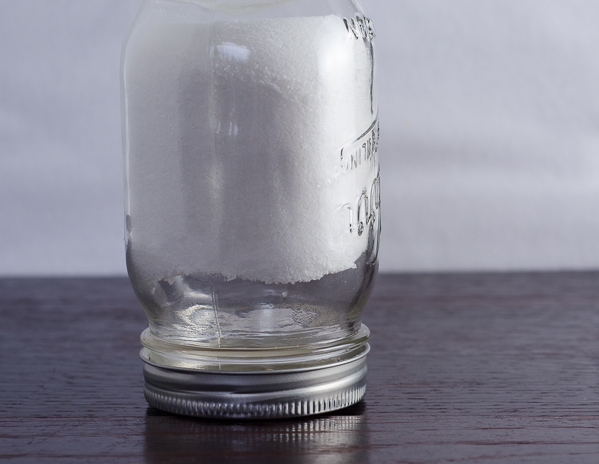 Epsom Salt (2 Tbsp. )- $2.86/64 oz means that 2 Tbsp. (1 oz.) costs $0.045. Lemon Juice (4 Tbsp. )- $2.98/32 oz. means that 4 Tbsp. (2 oz.) costs $0.186. Press into ice cube trays. Allow to harden (can take up to 3 days depending on how humid conditions are). Pop out of ice cube trays. Use 1 tab per load in dishwasher. *This is a recipe for dishwasher detergent. Don't eat it. **You can double or triple recipe if you want.